125 Of The Best Poetry Writing Prompts For Poets | Writer’s Relief - Writer's Relief, Inc.
Congratulations, poet! Your search for poetry writing prompts is over—because Writer’s Relief has curated a HUGE collection of free writing prompts and poetry exercises that will fire up your creativity! You are welcome to post the results of these poetry writing prompts in our comments section: But be aware of publishing industry standards regarding what is considered previously published writing. Just think—the poem you write using these poetry writing prompts might be your next literary magazine publication! And if you want help getting your poems published by reputable presses, reach out to the submission experts at Writer’s Relief! Momentous Occasions. 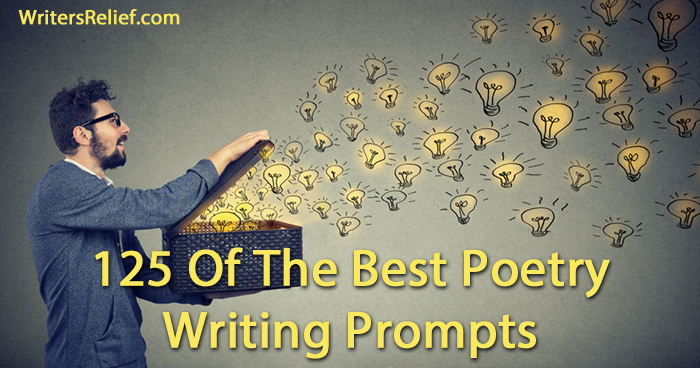 These poetry writing prompts focus on life’s big events—moments that are often emotionally charged and teeming with opportunity for poetic expression. Spend some time thinking about these moments in your life and then allow your memories to emerge as poems. Or, if you haven’t had any of these milestone moments, consider how you might write a poem based on the absence. Everyday Moments. While some poems are born of life’s most attention-grabbing events, others can be inspired by quiet, easy-to-overlook moments of the day. These poetry writing prompts and exercises ask you to pay close attention to all the little moments that might otherwise be missed. Nature And Space. Nature is often a source of inspiration for artists and poets. If you can get outside to write a poem, by all means do! But even if you’re stuck indoors, use your imagination to “head outdoors” and write a poem from your creative vision. Write about the following places and spaces however the muses may inspire you. You can describe memories or imaginings, reflect on the larger meanings of archetypes, or simply allow your heart to express its poetic wishes. Learn more about writing great nature poems. Food Inspirations. Flavors evoke myriad feelings, memories, expectations, and longings. Use these food-inspired poetry writing prompts to reflect on food-related topics and write a poem based on your reactions. The scent and feeling of picking strawberries/apples/etc. Meeting The Unexpected. These poetry writing prompts ask you to imagine a scene or moment—and then think of something that catches you (and readers) by surprise. What shocking and unexpected thing might you see in a crosswalk? What would that sight mean to you and others? Allow your mind to wander—and let your poetry surprise you. Mysterious Places. For these poetry writing prompts, we’re going to ask you to stretch your imaginations beyond the world of logic and fact and imagine that you can inhabit “in between” spaces. What would it feel like? What would you do? Or not do? Poetry Writing Exercises. Once you’ve written a poem in response to one of our poetry writing prompts, consider rewriting—this time in a poetry genre that is outside of your usual wheelhouse. Choose one of the poetry genres below. Fun With Poetry: 7 Days + 7 Games = One Week To Poetic Reinvigoration! Seven Techniques You Must Know To Make Editors Notice Your Poetry Submissions. Poetry Submission Turnoffs: Styles And Formatting That Make Editors Cringe. The Healing Power Of Confessional Poetry. Poetry Is A Lifestyle Choice: How To Keep A Poetic Frame Of Mind. How To Write Good Rhyming Poetry. Writer, Can You Help? Please add to our list of poetry writing prompt ideas by posting your own ideas for poetry topics in our comments section!